Now there are even MORE great ways to save at Sandals, with Sandals Specials by Resort. View all available resorts as well as specials! Enjoy exclusive added values like FREE nights, Airfare Credit, Spa Credit, FREE Golf, FREE Catamaran Cruises, FREE Couples Massage, FREE Candlelight Dinner, and a savings of 65%! 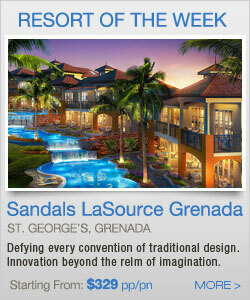 ALL NEW Sandals Resort – Sandals LaSource Grenada! Known as the “Island of Spice,” Grenada is a mesmerizing island with some of the most incredible natural wonders in the Caribbean from stunning beaches and waterfalls to lush rainforests and pristine mountain lakes. Deep within the idyllic waters of the Exumas, the new Sandals Emerald Bay Luxury Included® resort in the Bahamas brings unprecedented luxury to the easy-going rhythms of the Bahamian Out Islands. Here, a privileged enclave is designed to ensure you will feel as if you are the only ones there, where service reigns supreme and Bahamian-style architecture of elegant villas and suites harmonize with nature.